With three burners and 529 square inches of cooking space, this grill is the perfect size for most families. You’ll get 30,000 BTUs of cooking power so you can sear steaks and cook kebabs like a professional griller. The reversible cooking grates are made of porcelain-enameled cast iron and they're surprisingly easy to clean (they're still capable of producing impressive grill marks though). Because they're reversible, the thinner side is great for delicate foods, while the thick side makes sure your grill marks look sizable. Flavorizer bars keep the burners clean and also create the flavorful smoke that you crave. A fuel gauge lets you see how much propane you have left, so you won’t run out in the middle of cooking. There is an open cart with a bottom shelf for convenient access to the propane tank, and two side shelves give you space for plates, condiments, and sauces. One side shelf folds down, so the grill is more compact in storage. There are also six hooks for brushes and cooking utensils. If you need to move the grill to a better spot for cooking, two large wheels make it easy to roll, and the grease management system makes for cleanup easy when the cooking is done. You don’t need to spend a lot of money just to grill burgers and wings on warm summer weekends. This budget-friendly grill will give you 280 square inches of cooking space and it has two stainless steel burners that give you a total of 20,000 BTUs of cooking power. The body of the grill is made from porcelain-coated steel that will stand up to heat and weather, while the porcelain coated grill grates will help prevent food from sticking while still giving you the grill marks you look for. Two metal side shelves give you space for tools, sauces, and condiments. This grill has two 6-inch wheels that make it easy to roll across the deck to the perfect cooking spot, while the two fixed legs make sure it won’t move if accidentally bumped. 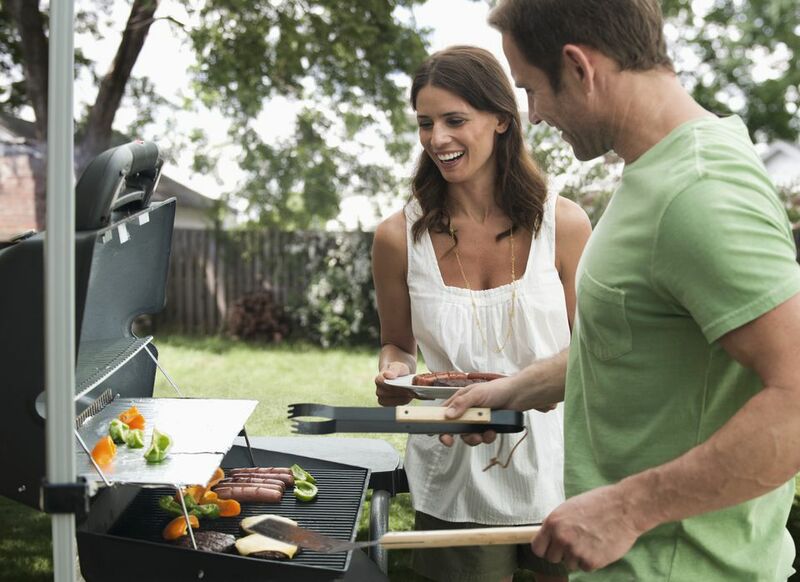 Using natural gas to fuel your grill means you’ll never have to run out to replace your propane tanks again. Just turn on the gas, fire up the grill, and you’re ready to start cooking! This grill has two burners and 380 square inches of primary cooking space along with 114 square inches of space on the warming rack, so you’ll have room for dinner and for keeping food warm for serving. When not in use, the warming tray tucks away, giving you more overhead space so your beer-can chicken can stand proudly upright on the grill. This grill also has reversible porcelain-enameled cast iron cooking grates, an open cart to store supplies, and two side shelves for sauces and tools. Like larger Weber grills, this model has porcelain-enameled Flavorizer bars that keep the burners clean and vaporize drippings to create flavorful smoke for cooking, and the grease management system makes cleaning simple when the cooking is done. When portability is important, this handy grill can cook your dinner and then fold up to create a handy pull-along cart with two large wheels. It weighs just over 40 pounds, so it won't be too cumbersome to move around, even if you're taking a trip to the local park or beach. This has a single stainless steel loop burner that provides 15,000 BTUs of cooking power and 240 square inches of cooking space. The porcelain-enameled cast iron grill grate will give you impressive grill marks on your burgers, steaks, and chops. Two side tables give you space for your tools and condiments, and a built-in thermometer lets you check the internal temperature at a glance. Still can't find what you're looking for? Check out our roundup of the best portable grills. Sometimes, you need a grill that can offer just the right amount of space without taking up an entire patio. While we may all dream of having that large backyard to host massive BBQ parties, that isn’t always a realistic dream. Thankfully, you don’t have to give up on a great grilling experience or the ability to dazzle guests with your grilling skills. The right mid-sized grill is the perfect option for smaller yards and patios when you want to grill without limits. This 3-burner grill from Broil King offers everything you need in one affordable package. The superior burner design provides even heating and the heavy cast iron cooking grates give excellent heat transfer. What's more, the firebox design holds in heat for versatile cooking abilities. This grill is a fantastic value for anyone who wants to cook outdoors here but doesn't have space for an extra large sized grill. The 400 square inch cooking area is plenty for entertaining a few guests plus the 40,000 BTUs mean this grill is highly effective and producing the temperatures you need for your cookout food. Plus, side shelves make storing your tools and utensils a breeze. Want to see more options? Check out our list of the best small grills to buy now. When space is at a premium, this is another compact grill that will produce beautiful results while taking up significantly less room. The two side shelves fold down to make it more compact for storage while giving you plenty of space for tools, condiments, and plates when they’re extended. The four wheels make it easy to roll across the patio or into a convenient storage space. Although this is compact, it has three burners that provide 30,000 BTUs of cooking power and 330 square inches of primary cooking space. The cooking grids are made from cast iron and are reversible, giving you more cooking options, and a porcelain-coated warming rack gives you space to keep foods warm after cooking or to gently warm buns for serving. The enclosed, powder-coated steel cabinet gives you space to stash tools and supplies out of sight and the levelers on the front casters let you adjust the grill if your patio is uneven. Not too big, but not too small, this mid-sized grill is the perfect fit for families and outdoor gatherings. It has four burners and 60,000 BTUs of total cooking power, so you can get a great sear on your steaks every time. This has 513 square inches of primary cooking space, plus 210 square inches of additional space on the warming rack. This grill includes a side burner, so you can simmer a sauce or cook a side dish in your favorite saucepan without heating up the kitchen. A plug-in rotisserie kit with motor is also included. The grids are porcelain-enameled cast iron that’s easy to keep clean, while they provide even heating and impressive grill marks. The control knobs have a blue LED backlighting, so you can see the settings when cooking runs into overtime. Two side shelves give you plenty of space for sauces and plates, and tool hooks let you hang your tools and bushes nearby. This has an enclosed cart that holds the propane tank and more. A zinc-coated catch tray collects drippings, fallen food, and burned bits for easy removal from the rear when it’s time to clean up. 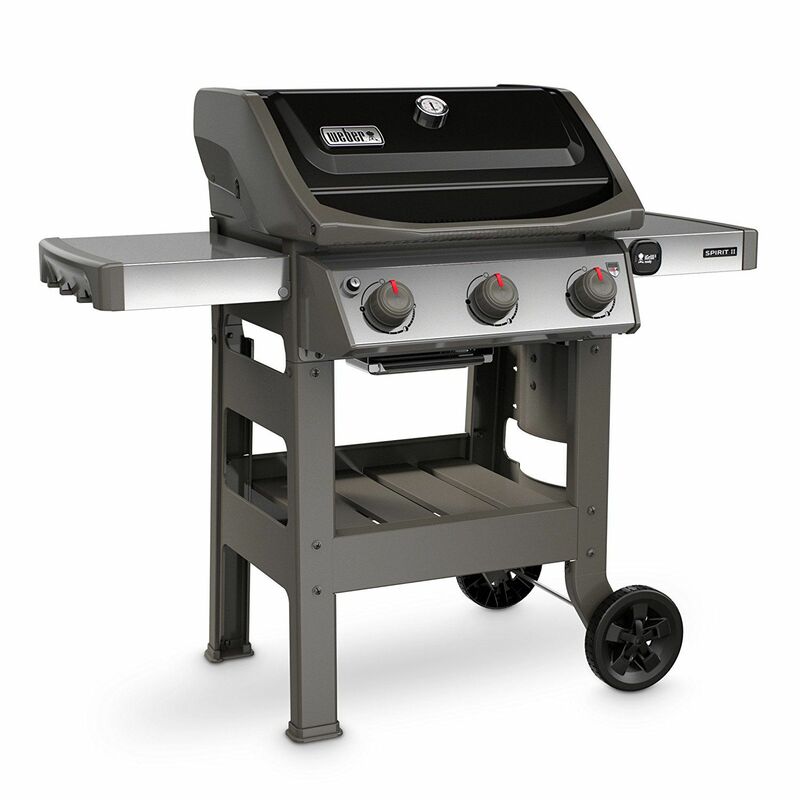 If you need to move the grill, four heavy-duty locking casters make the job easy. When you need to feed a large family or cook for a large party, this large grill gives you plenty of space and its price tag won't break the bank. The stainless steel finish with black accents looks attractive and but can still withstand harsh weather conditions. You’ll get 550 square inches of primary cooking space on porcelain-enameled cast iron grids, along with an extra 210 square inches of space on the porcelain-coated warming rack. The primary burners give you 45,000 BTUs of cooking power, and a side burner offers an additional 10,000 BTUs, so you can simmer a sauce while you’re cooking your meal. When not in use, the cover over the side burner lets you use that space as a side table, while a second side table gives even more room. A porcelain-coated grease pan makes this simple to clean when cooking is done. Our reviewers spent 20 hours testing one of the most popular gas grills under $500 on the market. 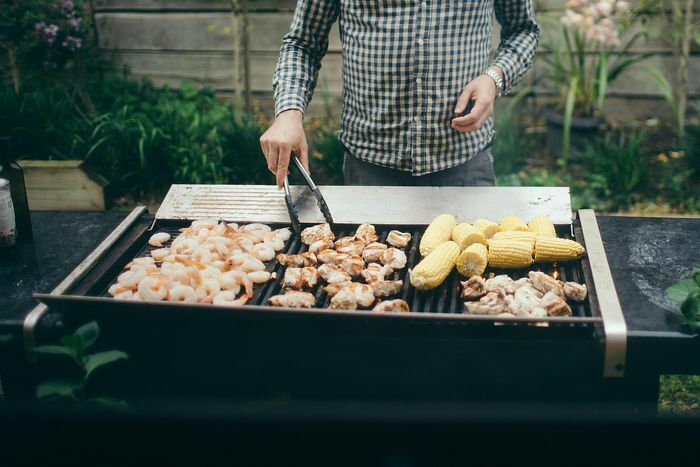 To ensure the most thorough feedback possible, we asked our testers to consider the most important features when using this grill — from its size to its various features — and we've outlined them here so that you, too, know what to look for when shopping. Size A grill with at least two burners offers more flexibility and temperature control. Surface area, which is measured in square inches, is the most important measurement when evaluating size. A 450- to 500-square-inch grill is sufficient for most — these models can cook up to 24 burgers at a time. BTU BTU indicates gas output and how much heat a grill can generate, but it isn’t a great measurement of efficacy. Look for a grill with a large temperature range instead — premium models may have infrared burners that can climb as high as 700 degrees or more. ﻿Features Choose a gas grill that has an automatic starter and a removable upper cooking grate for indirect cooking (ideal for buns, veggies, and large cuts of meat). A propane gauge is a huge advantage. A side burner is also nice to have but often underutilized. Premium features include built-in LED lights and wireless temperature monitors. One of our testers was pleasantly surprised at how easy this grill was to set up: “Amazon suggests that assembly time is typically around three hours,” he said, “but it only took me 1.5 without help.” Our reviewers also loved how quickly this grill heated up, plus the amount of surface area it had for its size. “There was more than enough grill space for everything I wanted to cook,” said one tester. “I was able to get six burgers, seven kabobs, and four hot dogs [at the same time] — plus, the bun warmer offers extra space.” One thing our reviewers did wish for was a side burner. Char-Broil Classic 480 Model Gas Grill: Worth the Cost?